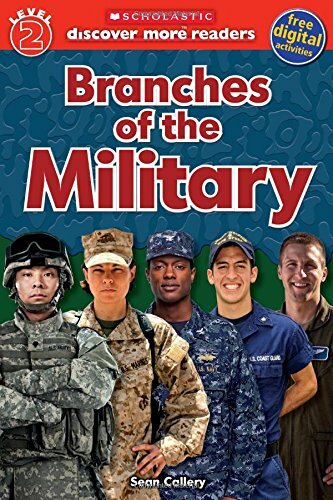 Learn all about the five branches of the US military in this new Scholastic Discover More Reader! Over 1.4 million men and women are responsible for protecting the United States, both in wartime and in peacetime. These men and women belong to the five different branches of the military. This Level 2 Reader teaches reluctant readers all about the Army, Navy, Marine Corps, Coast Guard, and Air Force, using simple text and full-color photos throughout. With compelling themes, supporting facts, technical vocabulary, infographics, vivid maps and charts, and a variety of writing styles and text structures, Scholastic Discover More Readers are tailored to the new era of high expectations. The unique informational text reading levels have been developed and vetted by Scholastic reading experts. View More In Jobs & Careers. If you have any questions about this product by Scholastic Paperback Nonfiction, contact us by completing and submitting the form below. If you are looking for a specif part number, please include it with your message.